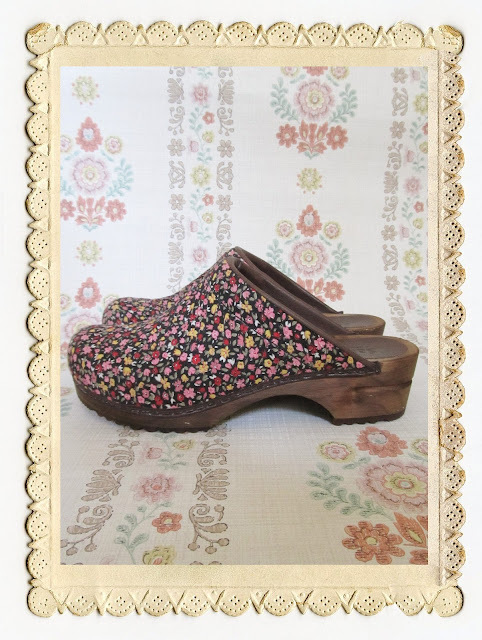 i do love a nice pair of clogs, be them sandals, boots or traditional, i am most fond of them all. when i was a child i wore them all the time, then an incident of the utmost worst kind happened and i never wore them again. however in recent years i have been reunited with wearing them and i cannot think of any other footwear i would rather clippity clop around it. there are many options for clog wearers, they come in many colours and designs. me, myself and i prefer a wooden base for maximum clopping. when i visit my soul sister's home in old blighty, she has quite the wooden staircase and this has proven to be most satisfactory for clopping. please find below just a few of my favourite pairs, all rather bedraggled and loved for they are worn greatly so please do excuse the 'used' look. after i have shown you photos of my 'could do with a clean' clogs, i will impart an itty bitty bit of wisdom i have found to be true with clog wearing. i found my 'truly loved and lived in all summer long sandals' from the wonderful world of MIA they are what i call an all rounder clog for the summer, being made of tan leather they go with every frock i own and i especially like wearing them with woolly black tights and a frock when temperatures drop. last year my friend Emily kindly gifted me a pair of these clogs from the fabby Ugglebo Toffeln, up until that point i had not tried them before. 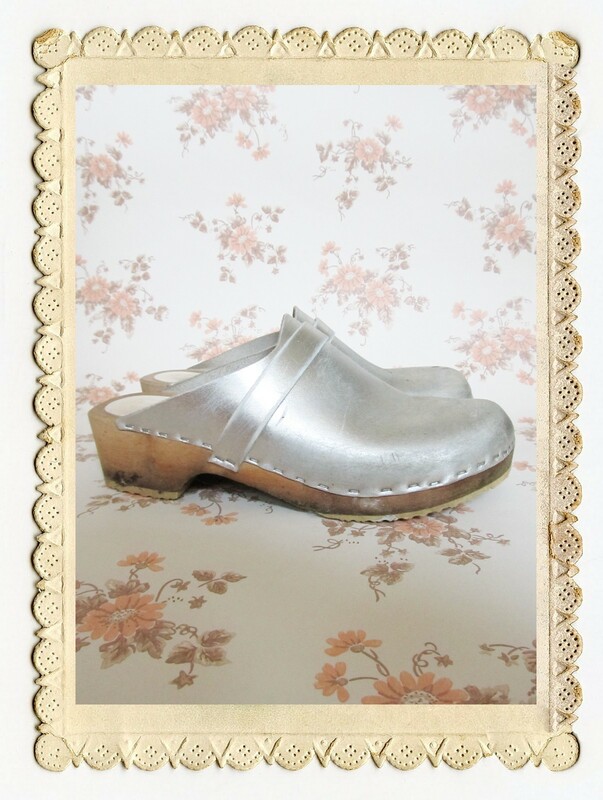 when spring turned into summer these became my staple footwear in the backyard, for when these silver sweeties were upon my feet i imagined i was holidaying on some lovely Greek island and my legs softly tanned from days in the sun. yes it is quite true to say, they are made of the softest leather once worn in and mold beautifully to one's foot. if you are eagle eyed, you may note from the wooden souls that i have chickens free ranging in my back yard. so there we have it, just a few of the clog makers i have worn, having now written this cloggy write up it has me wishing to venture to other clog makers in the world and see what wonders they make too. 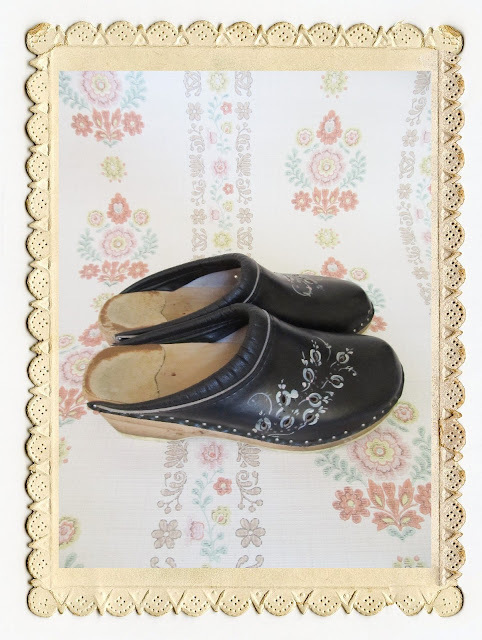 "do not wear your clogs all day every day when you first get them, like any good friendship worth its salt. take it a little bit at a time, wear them for a few hours a day, every day and several weeks on, you will wake up, put your fine cloggy friends upon your feet and exclaim how they feel just like a pair of slippers and never take them off again until you go to bed that night. just a few weeks of patience and i promise you will have a pair of clogs giving you a lifetime of clogginess"